The North American theatre has been talking about gender parity and diversity for decades, yet the leadership of the institutions has remained predominantly white and overwhelmingly male. But, with the unprecedented level of leadership changes in the North American theatre—which we’ve been tracking at HowlRound through the Changeover series—the tide seemed to be turning. The pace of announcements naming women and people of color as the new artistic directors has accelerated. So, now what? Did we do it? Are we diverse now? Have we emerged out of the period of white patriarchy in North American theatre? Have we moved into one of inclusivity and equity? Should we have a party or something? As I wrote at the start of the series, the hiring of new leaders is only the beginning of the protracted and risk-ladened process of transformation about to move through all of these institutions, and, by extension, the field. If we intend for these changeovers to take root and these transitions to succeed, the new leaders will need sustained attention and support from those of us in the field who are not directly caught up in the changeover. I believe it is an open question right now as to whether this is a moment or a movement. Sign me up for the movement. Toward that end, I offer those at work on the transition process some of my own learning from the leadership changes at ArtsEmerson, where I am artistic director, co-leading with executive director David Howse. I am not suggesting what we’ve done is the recipe for your institution. But elements of what we’ve done, along with what we’ve learned, may have meaning and relevance for some going through it. As always, I invite others to share their own learning. HowlRound, at its best, is a knowledge commons, a space where the accumulated knowledge of the field is developed and shared. Say you’ve just hired a new artistic director. Or you are the new artistic director. Every hire is the result of a process, in some cases protracted, in others lightning fast, and this decision is the result. Most of the time we think about what needs to happen to get to the result we desire. But the “what” is sitting atop a deeper question: “Why does what we desire matter?” To some degree, everyone involved in the hiring process has answered the “what” question of what is to be done (“hire X person,” “accept the job offer”). But have you, together, answered the “why”? There is a very helpful short video by Simon Sinek that lays down the case for starting any process by first answering the “why.” It is in that sort of quippy manner of a Ted Talk, which is sometimes grating for me, but it is wise and has the virtue of being easily grasped if you can get past that. Every single organization on the planet knows what they do. Some know how they do it. But very, very few know why they do what they do… And by why, I mean what’s your cause, your purpose, your belief? 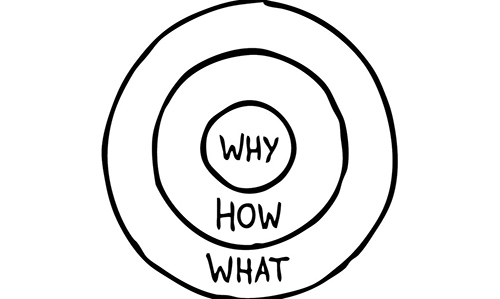 In practice, I have found that “why?” can be asked and answered at any decision juncture in the process of evolving an organization. The mission, vision, and values are the North Star, and at every decision point we want to turn to it to articulate why we make a certain call over other options. When everyone on a team understands why something is being done, and how it relates to the mission, people pull together in that direction even when it is harder. So, before we start talking about what we are going to do, we first ask ourselves why we are going to do something at all. If we intend for these changeovers to take root and these transitions to succeed, the new leaders will need sustained attention and support from those of us in the field who are not directly caught up in the changeover. Your “why” will be uncovered, not imposed. It already sits at the center of that intersection and is specific to your institution’s context. All of the factors that make up that context are woven into it. Deriving the institutional “why” at ArtsEmerson when I arrived was a process that, over time and through multiple transitions, involved the full leadership of the company. Our entire staff—and even our audience—has continued to engage in it. It was not solely, nor even primarily, the job of the artistic director or the leadership. Had we approached it that way, we would not have been successful at getting to something staff and stakeholders could own and consistently follow. Your new hire will not be able to supply the “why” on their own, nor will they be able to lead without owning it. And, once they own it, just as important is sharing that ownership with the entire team. ArtsEmerson’s “why” is not where your organization will, or even should, end up. And this is exactly what we want as a field, by the way. It leads to a diversity of organizations that are rooted in mission, vision, and values, and that are relevant to the place, time, and people they are linked to. But perhaps understanding how we uncovered our “why” will help you in the process of excavating yours. Perhaps because we were new (ArtsEmerson was founded in 2010), and had no legacy to uphold, it was easier to ground ourselves in the larger context of our city than older institutions may experience. But it was also because my come-from was as a community organizer. I was part of the equation, and everything I have done can be mapped back to that piece in me. I think it’s possible for any organization to find something beyond the institution’s sustainability to anchor their purpose in. It may not be community-centered the way ArtsEmerson’s is, but it needn’t be solipsistic either. Moreover, I think a “why” that is answered entirely in terms of sustainability arguments for the institution itself, or a generic “because art is important” or “diversity is important,” will fail you. All of these circumstances were baked into the DNA of ArtsEmerson at its founding. And, rather than resist or ignore them, we leaned into them to discover our singular purpose. There was, as well, a branching of context as ArtsEmerson transitioned from the founding artistic director, Rob Orchard, to the new leadership team in 2015—this branching of context is happening now in each organization involved in the changeover. Rob’s history was with professional arts programs in an academic context. He’d founded both Yale Rep and ART before founding ArtsEmerson. But the new team—P. Carl, David Howse, and I—came from standalone contexts that shared community-centered values. So, in that handoff from Rob, the “why” at ArtsEmerson was reexamined and rearticulated to include the context of its new leaders’ values along with the original set of given circumstances. The mission, vision, and values are the North Star, and at every decision point we want to turn to it to articulate why we make a certain call over other options. Boston struggles with an outdated and harmful narrative around race and a shameful history. A 2018 Boston Globe series called “Boston. Racism. Image. Reality.” made it abundantly clear this was not just a reputational problem, but was, in fact, an ongoing and systemic problem of race-based inequity and unequal justice. The 2010 census, published the year ArtsEmerson was founded, showed us that Boston no longer had a cultural majority. The reality of this is not felt on a daily basis around the city, nor is it evident in our civic institutions. Boston remains balkanized around race and neighborhood, and the resources of the city remain inequitably distributed. While there is no cultural majority, there is a dominant culture—white culture—and at the time of our founding most of Boston’s institutions, especially in the cultural landscape, were faced into that historic dominance. Our opportunity was to establish a new cultural institution in the heart of the city that could face the present (a multicultural city with a single dominant culture) to get to the future (a diverse, inclusive, equitable environment in which each person can thrive), help transform the daily experience of a segregated city, and disrupt the dominant narrative for all Bostonians. ArtsEmerson was established as an arts presenter, focused on theatre, so that would be the delivery system for our efforts. We were going to focus on theatre, naturally, because we operate theatres, in the theatre district, and on the campus of a college of arts and communication with a strong theatre program. And we were all people with expertise in the form. And we were going to operate as a presenter instead of primarily producing our own work because the city was already very well served by producers of plays. The decision to present theatre, rather than produce it, was structured into the business model at the founding. At the same time, we were looking at the commitment to “program in the gaps” for what it could tell us about how to articulate our “why.” And we found that, while there were many producers of classics and American plays and musicals, and several local organizations devoted to touring Broadway fare, there was ample space in the realm of international theatre. These things led us to the decision to “put the world on stage.” Our name even became ArtsEmerson: The World On Stage. While plays and musicals were abundant in the landscape, the forms that dwelled at the edges were less so. We decided we would make space for ourselves by pushing at the boundaries of theatre and presenting hybrid, multidisciplinary work. But we couldn’t resolve the given of not competing around programming with our colleagues if we didn’t go further and find an audience and a community of support that wasn’t already being served. And that led us to focus on inclusivity, on the people who were not already seeing themselves as the priority—much less the owners—of downtown spaces and culture. It led us to a commitment to create an authentic invitation for those not already centered in the Boston arts audience to make a home in ours. And that led us to the neighborhoods, where a lot of our activity now takes place. As a result, ArtsEmerson puts the rich diversity of cultures of the world on stage and invites the diversity of the city into the audience. We let the experience of sitting in that space together, and the resulting conversations, advance a practice of connecting across differences, and in that practice we’re all helping Boston’s controlling narrative transform. I talk about it as transforming the city through shared experiences of art and public dialogue. So, what’s the “why” of ArtsEmerson today? Because we are making space for people to experience Boston as a city enlivened by—and powered by—its diversity. Through a shared experience of art, designed to foster connections across differences, we are helping call into being a city where each of us can thrive. Is that the “why” of your place? Most likely not. But the process of leaning into the given circumstances that define the parameters of your institutional vision—your geography, your physical space, your role in the region, your existing audience, your organization’s specific expertise with art, your position within the cultural landscape of your community, the come-froms of your leadership team—will guide you toward the answer at the center of that Golden Circle. Once you uncover it, use it. Ask yourselves “why?” at every juncture. At ArtsEmerson, we start every project, every program, every strategy and planning meeting by answering “why?” It’s a discipline that at times feels empty or obvious, but we stick with it for those moments when it’s harder or more obscure. Why this choice, in relation to what we are here to do? It’s a question David Howse and I are asked to answer each time. And we, as the leadership, are open to being challenged on our answer. Each piece in our season, each stage in our theory of change, each hire is thereby connected to the same root before we move onto the questions of what we’re going to do and how. It’s something that takes less than two minutes to do but orients everyone at the table. So, back to your specific circumstance. You’ve now hired an artistic director that represents something about your collective hopes for the future. Your organization has determined this new leader is how you are going to get where you want to go. And you are busy developing the “what”—the programs and initiatives of this new era. But have you, together as stewards of this organization, agreed on why you go at all? Your new artistic director is responsible for leading, or co-leading, your whole community toward achieving your mission, vision, and values. “Because art is good for you” won’t lead you very far or guide you in hard moments. “For our human enlargement,” though important and true, is too abstract to live in moment by moment. “Because we’re too big, too old, to fail” or “because we have a huge endowment” doesn’t say why this hire, why now, why this program. Nor, frankly, does “we wanted diversity in the leadership.” So, why? By rooting the “why” deeply in the larger context surrounding ArtsEmerson, we have been able to chart a coherent course through challenging waters. And it’s one that our entire stakeholder community can understand, can see themselves in, and can hold us accountable to as we go along. I’ve written about this elsewhere, but I cannot overstate how important the simple formulation of these next two questions has been to me, and to ArtsEmerson, as we picked our way toward civic transformation through shared experience of art. The formulation of these questions were suggested to us by a long-time supporter, Jacqui Lindsay. Don’t take it for granted that something you like, or that sounds good or looks good to the outside world, is actually demanding to be done. There are some things that are gaudy and shiny that have no deeper reason for being. Or they’ve already been done in your area, and another version of the same thing is not helpful to anyone. Or they reinforce a narrative that is counter to your values or the organization’s purpose. Or someone is doing it already and you’ll either be competing in a way that disrupts their progress or crowded out in that space before you get going. So, look around and look at the idea (the show, the hire, the program, the initiative) and answer the question of whether this is to be done. This is the big one. But only after the first one has been answered “yes.” You can’t skip to here and get its value. First, is it to be done? If yes, then, is it ours to do? And to answer this question, we return to the “why” every time. And if we can’t articulate it within the scope of our “why,” then it is not ours to do. No matter how shiny or important. This sounds so obvious. But it wasn’t, I promise you. Once we began really using it, we created a path through every decision we’ve had to make that has taken us closer to our goals and answered every challenge. We are less distracted by “opportunities,” and, at the same time, less apt to miss true opportunities. We are coherent—to ourselves, to our stakeholders, to funders, and to audiences. They can feel the ArtsEmerson-ness of a thing, even if they can’t fully articulate it. We can hear it, and see it, in their survey comments and post-performance feedback, and in the way they speak about us with their own networks. I am confident there are many other ways to arrive at a coherent sense of direction and a shared sense of responsibility for getting there. I would love to read others. And if you are in motion on a transition and making discoveries of your own, please contribute those to the conversation, whether here in the comments, in your own post, or on your own social media sites. A “howlround” is a feedback loop—the sound a speaker makes when you stick the microphone in front of it. This site is specifically designed for the field to feed back on itself. The Changeover series has been all about collecting the wisdom of the field in one accessible, democratized space so it is available to everyone involved in the changeover. We are all in this moment together. Nobody has to go it alone. Thank you for articulating all of this David. A very insightful framework for thinking about the big organizational questions, and the placing the work in larger cultural context. Clear and well laid out as always. Love this article, David! Thank you for your candid and insightful remarks about ArtsEmerson's ongoing journey. Thank you. It is a journey and I am glad to be part of it.